See more objects with the color silver darkslategrey darkgrey rosybrown dimgrey or see all the colors for this object. This is a Pitcher. It was designed by Leon Ransmeier and manufactured by The Corning Museum of Glass. This object is not part of the Cooper Hewitt's permanent collection. It was able to spend time at the museum on loan from Leon Ransmeier	as part of Beautiful Users. It is dated 2012. Its medium is handblown glass. 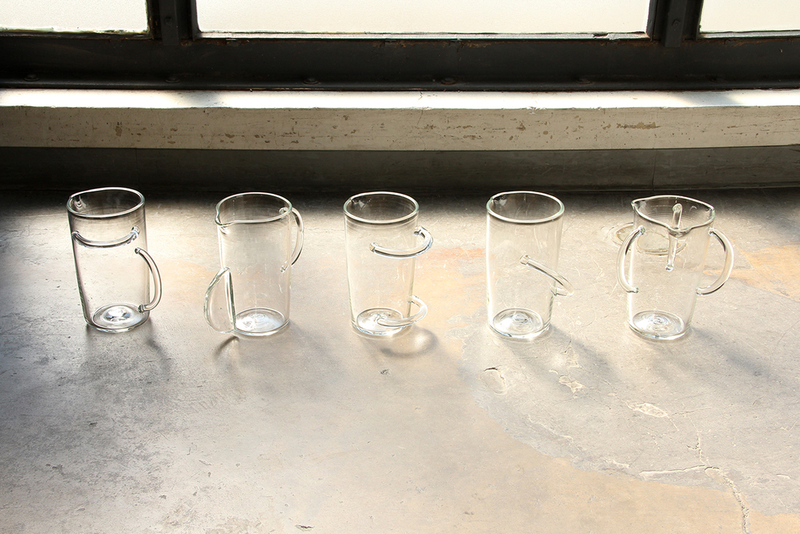 The handles in these pitchers accommodate different user behaviors. Ransmeier made cardboard prototypes to establish the basic shape and performance of each vessel. He worked with artisans from GlassLab, a mobile hot-glass studio operated by the Corning Museum of Glass, to translate his prototypes into glass. It is credited Courtesy of the designer. H x W x D: 240 x 120 cm (7 ft. 10 1/2 in. x 47 1/4 in.) Plus handles.